KIEV, Ukraine -- People in Ukraine are ready to turn their back what the country’s central bank has described as ‘the worst year since World War II’. 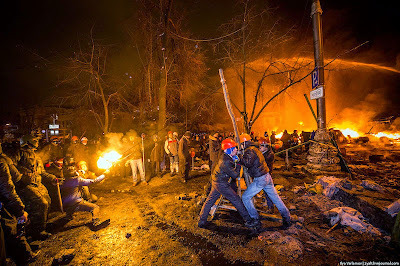 2014 Kiev Maidan revolution which deposed pro-Russia President Viktor Yanukovych. Many internally displaced Ukrainians will ring in the new year in Kyiv’s Independence Square where violent protests forced former President Viktor Yanukovych to flee in February 2014. A large tree has been decorated with flags and posters, including a picture of opposition politician Yulia Tymoshenko. The square was the centre of the violent protests that forced former President Viktor Yanukovych to flee. The months-long demonstrations were sparked by Yanukovych’s decision to back away from closer ties with the European Union and turn toward Russia, but grew to encompass widespread discontent with corruption and a lack of democratic freedoms. Maria Maksymenkova, a 22-year-old Maidan activist and volunteer, was on the final stage of her university course when the protests began. She joined the protesters, cooking food for other activists and distributing hot drinks in the cold winter weather. Maksymenkova said that none of the activists had expected the conflict to break out in eastern Ukraine, describing 2014 as a ‘year of shock’. She said she hoped 2015 would bring an end to the violence. Ukraine’s Prime Minister Arseniy Yatsenyuk addressed a news conference on Tuesday in Kiev. “Why did Putin send his army to Ukraine? What was his aim? Protecting the Russian language? But all of Ukraine speaks Russian, we don’t need protection. Protecting Donetsk and Luhansk? From whom? Five thousand people killed – this is what Russia’s responsible for,” he said. Russia has repeatedly denied sending troops to Ukraine in support of a rebellion against Kiev. Meanwhile pro-Russian rebels on Monday met with Ukrainian soldiers in Donetsk to hand over an injured Ukrainian solider, according to the rebels. Footage provided by the rebels allegedly shows the separatists waiting for Ukrainians on a bridge near an old terminal of the Donetsk Airport. The rebels then escorted the Ukrainian vehicle to an area where the allegedly wounded Ukrainian soldier was waiting to be collected. In the video given to the Associated Press news agency by the self-proclaimed Dontesk People’s Republic, two of the rebels expressed their wishes for 2015. In the "Tale of Two Cities" Charles Dickens started off his novel with this observation: "It was the best of times, it was the worst of times." And, indeed, Ukrainian history will record that 2014 was such a year. We all know why it was the worst of times.....naked, unprovoked Russian aggression against a peaceful neighbor to satisfy the leadership's (and a large part of its population) continued superannuated fantasy of "Russkiy Mir". But it was also the best of times because Ukraine, after almost four centuries of subordination and vassalage to Russia, finally and for all time freed itself from any delusions it may have had concerning its northern neighbor. Against all odds and threats, Ukraine set its course irrevocably to the West and was happy to see the darkness that is Russia "ïn its rear-view mirror". It was the best of times because Ukrainians came together like never before to recognize the value of having a state that is reflective of Ukraine's interests, and to assert a national identity, history, language, and culture markedly distinct from that of Russia. It was the best of times because Ukrainians gained a sense of empowerment in standing up to Russia while much of the world fumbled. It was the best of times because the new government - unlike the several that had preceded it during Ukraine's 20 years of independence - seriously started a broad-based program of reform, rule of law, and true democracy and transparency. It was the best of times because the old, neo-Soviet oligarchs and politicians were - to a great extent - replaced by younger and reform oriented officials. The battle against corruption has only begun, but the commitment to clean out the stable is real. It was the best of times because no country will ever again have doubts concerning the legitimacy pf Ukrainian statehood. It was the best of times because 2014 also marked the beginning of the end of despotism and tyranny in the post-Soviet world as the people of Russia, Byelorussia, Kazakhstan, etc. begin to take notice of the fresh breathe of freedom radiating from Ukraine. All-in-all, although 2015 will still be a difficult year and filled with new dangers for Ukraine, the genie is out of the bottle and can never be put back in.